We all have the power to educate and make a difference to the lives of animals. 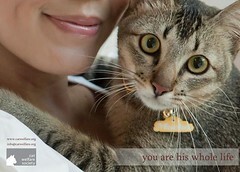 Be their voice. Share these education materials to your social media or with family and friends to start a conversation. Incorporate them into your classroom teaching. Create your own materials and share them with us! 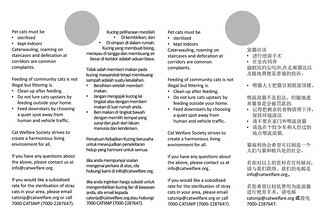 Town Councils have started to work with caregivers and adopt a humane cat management approach to the community cats in their estates. 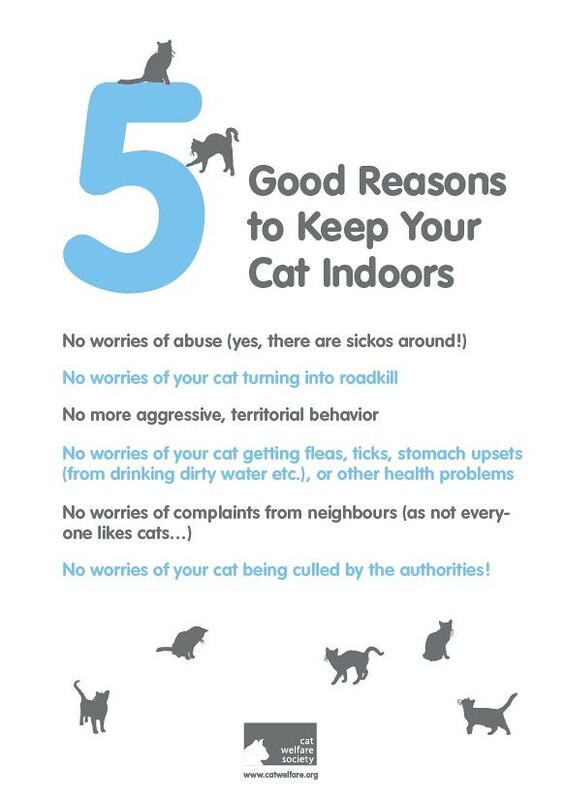 This includes handling cat-related complaints and feedback in an amicable manner. While there are many caregivers already actively assisting in these issues, we need more volunteers to join them in the efforts to educate residents. The following flyers aims to assist volunteers in their efforts. 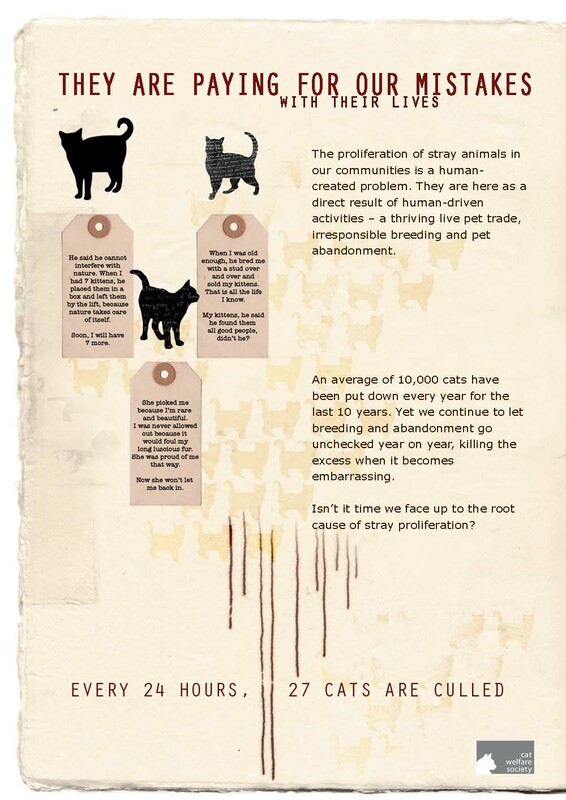 We can all be proactive in addressing irresponsible cat ownership and feeding in our neighbourhoods to keep our pet and community cats safe. 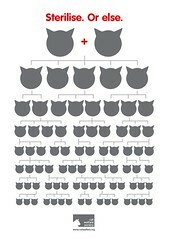 If you come across any such owners or feeders, help make contact with them with the following materials. 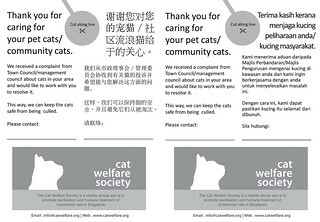 Flyer for Feedback Providers: Provides brief information about addressing cat-related issues effectively and humanely. 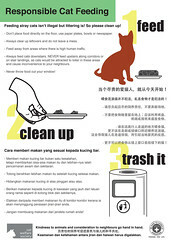 Flyer for Cat Owners/Feeders: Provides advise to cat owners or feeders on how to keep their cats safe with consideration to their neighbours. Many cat-related issues are caused by cat owners or feeders who may not know what is the appropriate way to care for cats. 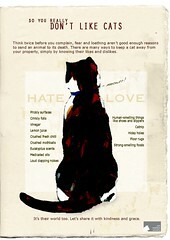 Advisory for Cat Owners/Feeders: A more pointed advisory if cat owners or feeders remain recalcitrant. If problem persists, report to AVA and NEA respectively for enforcement. MUIS Fatwa on Neutering Cats: Fatwa issued by MUIS that sterilisation of cats is permissible. 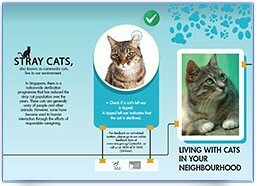 Targeted Message for Cat Feeders: To be used where irresponsible feeding often occurs to connect with elusive feeders as well as to educate them. If irresponsible feeding persists, report to NEA for enforcement. 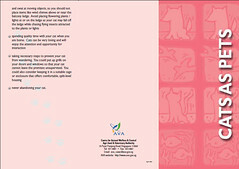 These flyers can be accompanied by a copy of the “Animals in the Heartlands” Booklet to provide recipients with more information and knowledge. 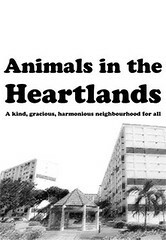 “Animals in the Heartlands” aims to raise awareness and understanding of animal issues in our neighbourhoods through a comprehensive booklet with useful information about how to be a better pet owner, how to report abuse, how to handle community cat issues, with relevant contact information and more. 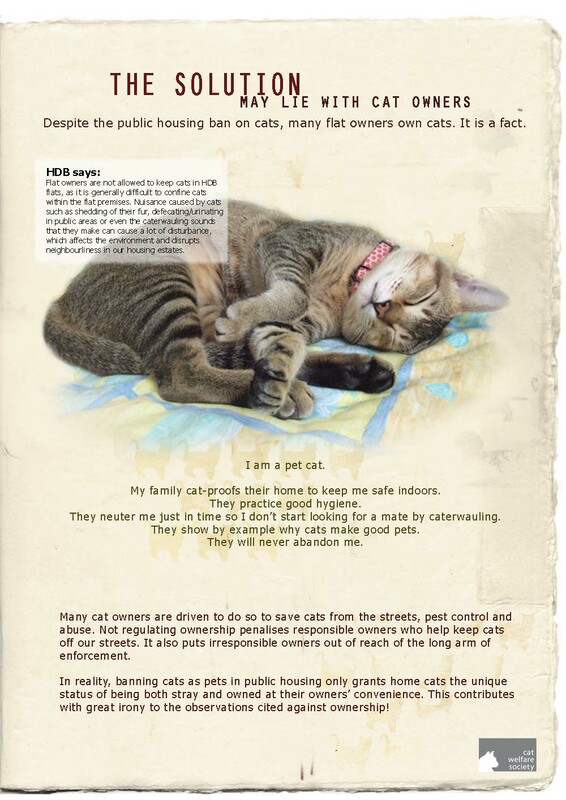 It is jointly launched by the Cat Welfare Society, Action for Singapore Dogs, House Rabbit Society of Singapore and the Society for the Prevention of Cruelty to Animals. 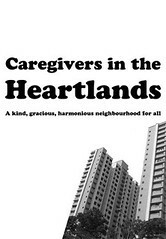 This community booklet is meant for mass distribution to all residents to promote a kinder, more gracious and harmonious neighbourhood for everyone. 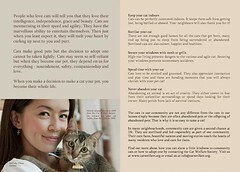 “Caregivers in the Heartlands” aims to empower more people to improve the welfare of community cats in Singapore. 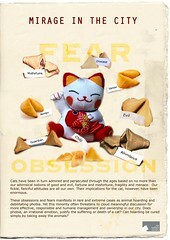 It is meant for caregivers and anyone who wants to play a part. 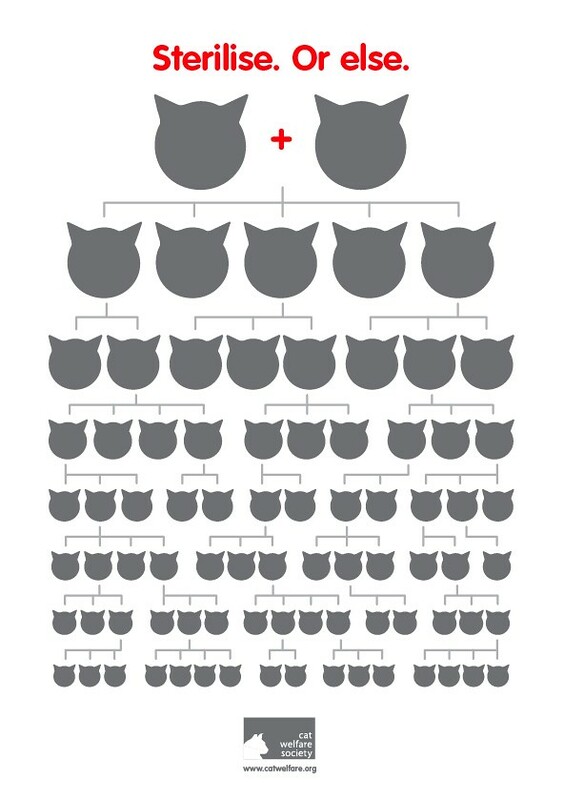 You can also find similar information on Animal & Our Community which is available online and in booklet form – a collaboration between AVA and Cat Welfare Society – available from AVA head office and at their events. 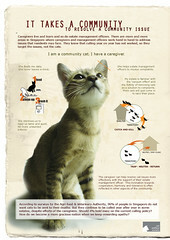 These posters comprehensively summarises and covers the range of issues related to cat welfare. You can request for them to be put up in schools or community spaces for education and awareness. 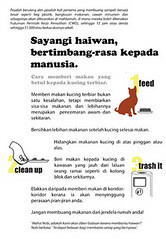 The Responsible Feeding poster, in 3 languages, can be used to educate residents about good feeding practices. Request for your Town Council to place it at affected areas. Alternatively, you can use it to engage feeders directly. 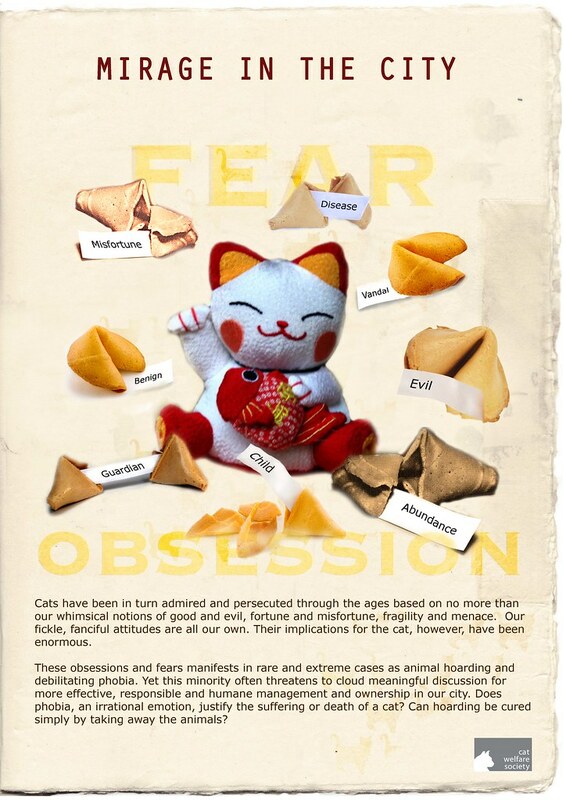 If you are a feeder, do exercise good feeding habits and carry the poster or brochure with you to educate others who may have misconceptions about this practice. 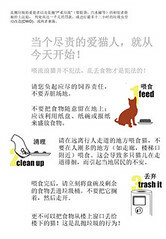 A Targeted Message for Cat Feeders can also be used to reach out to feeders who may be elusive by placing it where feeding occurs, when these feeders are not feeding in the right location or do not clean up after feeding. 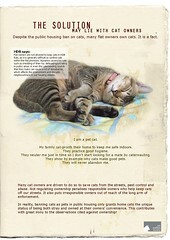 These brochures contain information about how to be a responsible cat owner. 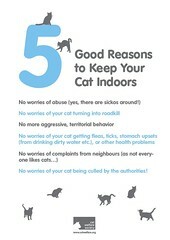 The second, by AVA, provides authority on cats being good indoor pets. 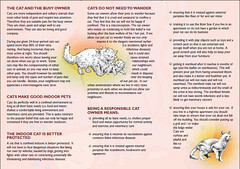 If you know of cat owners who are not keeping cats responsibly, put these brochures into their mailbox or better still, talk to them and hand them the brochures personally. 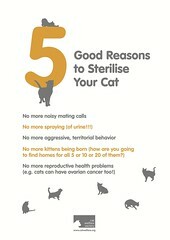 These easy to understand posters can also be used to encourage cat owners to sterilise and keep their pet cats indoors.